While TVs can provide a great viewing experience, there's only way to truly match the feeling of a movie theater in your home, and that's by installing a projector. Let's look it, the latest flicks and sports look much better on the big screen (you'll be so in the game that you may even find yourself challenging the ref's calls). If you're looking to upgrade your home theater experience, take a look at our best 4K (ultra high definition) and 1080P (high definition) projectors that range from budget-friendly to budget-bursting. 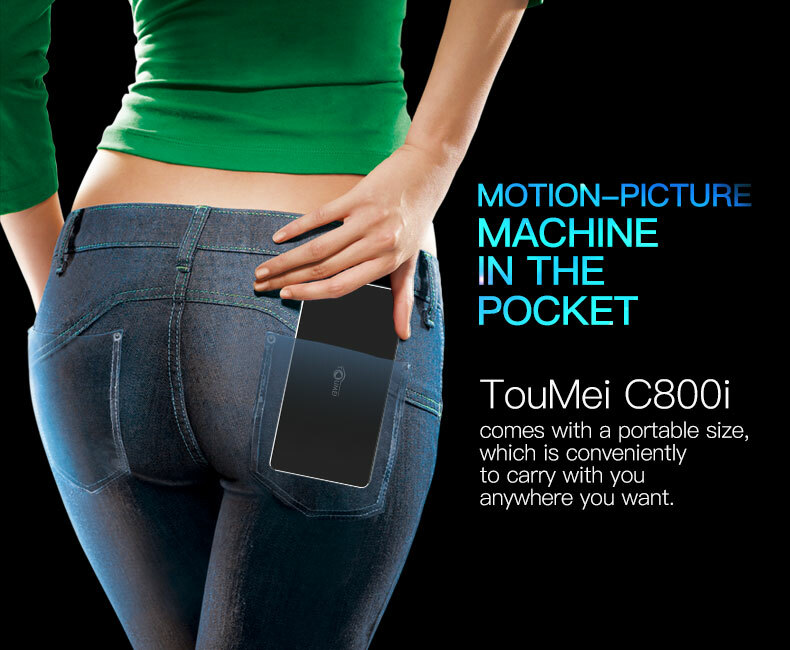 Toumei C800i Smart Mini Projector wins for best portability, thanks to its Dolby sound, screen share and a built-in battery. Unfortunately, portability means no 4K quality, but that's okay as you'll receive Full HD (1280 x 720) and a wireless connection to any Android device. With the built-in battery of 4200mAh, lasting up to 2.5 hours, but it support charged by a power bank with 2A current output, you can enjoy many films in the open air, and the battery life is offset by the 30,000 hours of LED life, which means you'll get 10 years of life even if you're watching up to eight hours of content every day. Toumei C800i Mini projector is the same size with iphone 7P, lightweight only 0.58lb, with a compact and portable Design easy to install. It is space saving while not in use. can be used indoors and outdoors for home and mobile entertainment, This mobile projector will quickly become your funny entertainment tool. Beyond battery, the C800i offers a wireless mirroring function that connects to both a smartphone and tablet.you can use Happycast app to realize it by your mobile phone, both android and iphone,and if yours is android mobile phone, you can enjoy wifidisplay functions, but many Samsung phones are not supported, such as S5, S6, S7. of course, you can realize the same-screen with computre by the HDMI cables, C800i support HDMI input. The display of movies, pictures, music and office documents is easy and can even be done connected to a USB drive. Additionally, the C800i supports wirelessly streaming sound directly from the projector to a Bluetooth-compatible sound system such as home audio speakers or headphones. Unlike traditional HDMI projector, toumei c800i projector is a true wireless projector. Get rid of the HDMI cable, can be taken to anywhere you want. Adopt the DLP Technology which use advanced Multi-Color processing, producing exceptional contrast ratios. No unwelcome rainbow artifacts or eye-strain. Guarantee bright images in light and dark conditions, without sacrificing image quality. While 4K may be its calling, Sony’s high-dynamic range allows for wide contrast and a high range of brightness levels without any sacrificing of picture quality. Additionally, Sony includes Motionflow technology that eliminates blur during action shots or sporting events. The 6,000 hours of rated lamp life means your maintenance costs are lower and will help keep your monthly running expenses lower, too. While 4K playback is increasingly common in the home-theater projector market, the Sony VPLVW365ES native 4K HDR 3D and SXRD home theater is the best 4K projector available today. With a screen-size range that allows 42 to 85 inches of viewing from up to eight feet away, 62 to 126 inches from up to 12 feet away and 83 to 167 inches from up to 16 feet away, the Sony’s 4K range is second-to-none. The 1,500 lumens of white brightness and 1,500 lumens of color brightness offer an immersive experience regardless of dark rooms or ambient light. The SXRD panel technology offers native 4K (4096 x 2160) resolution without artificial pixel enhancement allowing clearer details and natural image edges. A 1,000,000:1 dynamic contrast ratio helps ensure that in both bright and dark scenes there's no image detail spared. Additionally, there are presets for up to 10 different positions of motorized focus, zoom and lens shifts, as well as ultra-wide lens shifts to help get the exact setting depending on wall size and distance from the wall. And with wireless connectivity onboard, streaming from Netflix, Amazon Video or any other streaming service is as simple as play and go. Epson's Home Cinema 5040UBe is a crowd favorite and the world's first wireless HD projector with 4K content support. If your content isn't 4K ready, that's OK since the Epson offers HDR compatibility with both real-life color and ranging levels of brightness to help find that perfect picture. With 2,500 lumens of color brightness and 2,500 lumens of white brightness, there's plenty of power available for just about any kind of room and daytime viewing. Sony's new type of projection technology, Silicon X-tal Reflective Display or SXRD for short, helps achieve 4K playback offering 9.8 million pixels with a lifelike picture so good, you'll think you're immersed in the playback. The 1,000,000:1 ultra-detailed dynamic contrast and high-pressure 33W lamp achieve details of realism that are unparalleled in the projector space. Gone are the days of the washed-out projector playback, thanks to Sony's Advanced Iris 3 technology that automatically responds to light levels to help match the scene by bringing out more dark when necessary or preventing bright scenes from including too much light. You might need to take out a second mortgage to buy Sony's VPL-VW1100ES native 4K and 3D SXRD home-theater, but if you're looking to splurge on a high-end projector, this is it. The inclusion of stunning 4K resolution and 4K content upscaling for Full HD 1080p material are nice additions, but that's not why you fork over the big bucks. With viewing from 42 to 88 inches up to eight feet away, 62 to 130 inches from 12 feet and 81 to 172 inches up to 16 feet away, there's no question this Sony is as true to a theater-like experience as you can get. In fact, Sony even boasts that under ideal circumstances, this projector will handle up to 200 inches of playback without quality loss.